Win Two Nights at the Watermark Hotel and a 6 Course Degustation with Wine at Absynthe Restaurant. Enter your email address to receive Gold Coast Weddings Magazine e-newsletter and you’ll automatically go into the quarterly draw to win a romantic weekend for 2 at the Watermark Hotel & Spa. 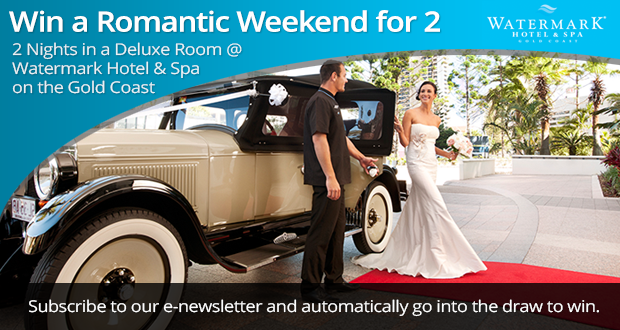 Subscribe to our newsletter and be automatically entered into the draw to win this romantic getaway. Prize includes 2 nights in a Deluxe Room on the higher floors of at Watermark Hotel & Spa for two people. The room features Comfort Plus bedding, views of the ocean or hinterland and a pillow menu for that added touch of luxury.